Is there a Christmas event at SEA LIFE Birmingham? Can I book a Christmas party at SEA LIFE Birmingham? Can I book an event at SEA LIFE Birmingham?  Do you have any events running throughout the year at SEA LIFE Birmingham? What is Quiet at the Aquarium? What are Pop Badge Swap Events? Yes! We welcome all to meet Santa at Sea Life Birmingham from 24th November - 23rd December! Included FREE with your entry ticket or Annual Pass - come to the North Pole of the city in our Antarctic Ice Cave and meet the man himself, whilst looking onto our family of cheeky Gentoo Penguins! Please note when purchasing tickets online the time slot you select is the time you enter the attraction. Pre-booking a time slot for Santa is not necessary, please simply ask for the next Meet & Greet time when you arrive at the attraction. To book, please visit here.